Twisted Tea® Text To Ride Sweepstakes (the “Sweepstakes”) is open to legal United States residents who are at least twenty-one (21) years of age at the time of entry. Employees (and their immediate families) of Twisted Tea Brewing Company (the “Sponsor”), Hello World, Inc., (the “Administrator”) and any of their parents, subsidiaries, affiliates, suppliers, independent contractors, agencies, alcoholic beverage wholesalers and retailers, and any persons living in the same household as such employees are not eligible to participate in the Sweepstakes (cumulatively, the “Sweepstakes Entities”). Sweepstakes is subject to all applicable federal, state, local laws and regulations and is void in where prohibited by law. The Sweepstakes begins on 3/1/2016 at or about 12:01 a.m. Eastern Standard Time (“EST”) and ends 11/6/2016 at or about 11:59 p.m. EST (the “Sweepstakes Period”). Prize winner will be selected in a random drawing on or around 11/10/2016 for all eligible entries received during the Sweepstakes Period. 2) Email: During the Sweepstakes Period, email OfficialRules@twistedtea.com (the “Email”) and provide your first and last name, complete mailing address (PO Boxes not accepted), telephone number, email address, date of birth and Official Entry Code “BAGGER”. In the event of a dispute over the identity of an online entrant, entry will be deemed submitted by the authorized account holder of the email account of the email address submitted at the time of entry. The “authorized account holder” is the natural person who is assigned to the email address by an internet access provider, online service provider or other organization that is responsible by assigning email address or the domain name associated with the submitted email address. Use of any device to automate entry is prohibited. For purpose of these Official Rules, “receipt” of an online entry occurs when the OfficialRules@twistedtea.com servers record the entry information upon clicking the submit button. Any automated computer receipt (such as one confirming delivery of the e-mail) does not constitute proof of actual receipt by Sponsor of an online entry for purposes of these Official Rules. Limited one (1) entry per person, per method of entry. Duplicate entries for a single individual and single method of entry will be disqualified. All entries become the property of the Sponsor. Ride for Kids is a national series of motorcycle charity events that raise awareness and funds for the Pediatric Brain Tumor Foundation, the world’s largest nonprofit funder of research into one of the deadliest forms of childhood cancer. The Ride for Kids program also funds free educational resources and college scholarships for brain tumor survivors. More than 28,000 children and teens in the United States are living with the diagnosis of a brain tumor, and nearly 13 more cases are identified each day. American Honda is the presenting sponsor of Ride for Kids. Other national supporters include GEICO and Cycle World magazine. To ride with us to cure the kids, call 800-253-6530 or go to www.rideforkids.org. How would you like to see every head turn as you ride by on your very own custom Victory Motorcycle, complete with its own matching custom Epiphone guitar? Register below to win the Sturgis Rider Motorcycle and Guitar Sweepstakes, and this dream could become your reality! 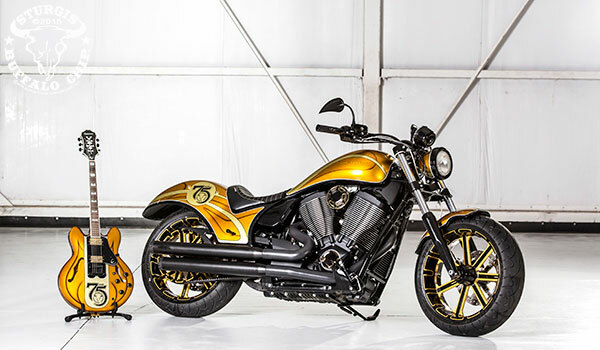 The Sturgis Buffalo Chip® has teamed up with Victory Motorcycles, Arlen Ness Motorcycles, Epiphone Guitar and AMSOIL to give one lucky Buffalo Chip fan their own 2014 Victory Gunner, customized by renowned builder Cory Ness. 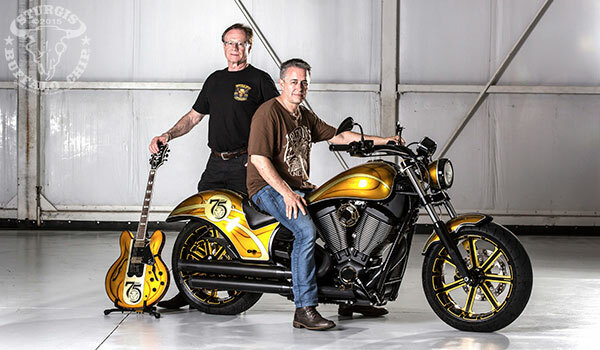 This one-of-a-kind low-profile, hot rod features a solid pro-stock rear section, a stout front end, loads of rock ‘n’ roll gold accents and is chock-full of distinctive custom Ness parts. Plus it comes with a beautiful Epiphone Sheraton II guitar to match!